Not to be confused with Outlook Express, Outlook.com, Outlook on the web, or Outlook Mobile. Microsoft Outlook has replaced Microsoft's previous scheduling and mail programs, Schedule+ and Exchange Client. 8.5 June 21, 1998 Freely distributed with books and magazines for coping with then newest Internet standard such as HTML mail. Outlook 98 setup was based on Active Setup which also installed Internet Explorer 4. 9.0 June 27, 1999 Included in Office 2000 and bundled with Exchange 2000 Server. Internet Mail Only or IMO mode: A lighter application mode with specific emphasis on POP3 accounts and IMAP accounts and including a lightweight Fax application. Corporate Workgroup or CW mode: A full MAPI client with specific emphasis on Microsoft Exchange accounts. The main Outlook 2007 interface with its menus and toolbars. Outlook 2007 with options for text message composition. The left-hand side depicts a preview of how the message will appear on the recipient's phone. Supported file types include Excel, PowerPoint, Visio, and Word files. If Outlook 2007 is installed on Windows Vista, then audio and video files can be previewed. If a compatible PDF reader such as Adobe Acrobat 8.1 is installed, PDF files can also be previewed. To-Do Bar that consolidates calendar information, flagged email, and tasks from OneNote 2007, Outlook 2007, Project 2007, and Windows SharePoint Services 3.0 websites within a central location. Microsoft also released several versions of Outlook for classic Mac OS, though it was only for use with Exchange servers. It was not provided as a component of Microsoft Office for Mac, but instead made available to users from administrators or by download. The final version was Outlook for Mac 2001, which was fairly similar to Outlook 2000 and 2002 apart from being exclusively for Exchange users. Microsoft Entourage was introduced as an Outlook-like application for Mac OS in Office 2001, but it lacked Exchange connectivity. Partial support for Exchange server became available natively in Mac OS X with Entourage 2004 Service Pack 2. Entourage is not directly equivalent to Outlook in terms of design or operation; rather, it is a distinct application which has several overlapping features including Exchange client capabilities. Somewhat improved Exchange support was added in Entourage 2008 Web Services Edition. Entourage was replaced by Outlook for Mac 2011, which features greater compatibility and parity with Outlook for Windows than Entourage offered. It is the first native version of Outlook for macOS. Outlook 2011 initially supported Mac OS X's Sync Services only for contacts, not events, tasks or notes. It also does not have a Project Manager equivalent to that in Entourage. 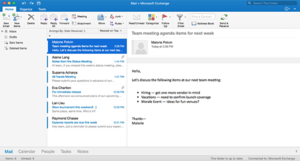 With Service Pack 1 (v 14.1.0), published on April 12, 2011, Outlook can now sync calendar, notes and tasks with Exchange 2007 and Exchange 2010. Master Category List support and enhancements delivering access to category lists (name and color) and sync between Mac, Microsoft Windows and OWA clients. In January 2015, Microsoft released Outlook for phones and for tablets (v1.3 build) with Office 365. This was the first Outlook for these platforms with email, calendar, and contacts. Outlook 2007 was the first Outlook to switch from Internet Explorer rendering engine to Microsoft Word 2007's. This means HTML and CSS items not handled by Word are no longer supported. On the other hand, HTML messages composed in Word look as they appeared to the author. This affects publishing newsletters and reports, because they frequently use intricate HTML and CSS to form their layout. For example, forms can no longer be embedded in email. Outlook for Windows has very limited CSS support compared to various other e-mail clients. Neither CSS1 (1996) nor CSS2 (1998) specifications are fully implemented and many CSS properties can only to be used with certain HTML elements for the desired effect. Some HTML attributes help achieve proper rendering of e-mails in Outlook, but most of these attributes are already deprecated in the HTML 4.0 specifications (1997). In order to achieve the best compatibility with Outlook, most HTML e-mails are created using multiple boxed tables, as the table element and its sub-elements support the width and height property in Outlook. No improvements have been made towards a more standards-compliant email client since the release of Outlook 2007. Outlook and Exchange Server internally handle messages, appointments and items as objects in a data model which is derived from the old proprietary Microsoft Mail system, the Rich Text Format from Microsoft Word and the complex OLE general data model. When these programs interface with other protocols such as the various Internet and X.400 protocols, they try to map this internal model onto those protocols in a way that can be reversed if the ultimate recipient is also running Outlook or Exchange. This focus on the possibility that emails and other items will ultimately be converted back to Microsoft Mail format is so extreme that if Outlook/Exchange cannot figure out a way to encode the complete data in the standard format, it simply encodes the entire message/item in a proprietary binary format called Transport Neutral Encapsulation Format (TNEF) and sends this as an attached file (usually named "winmail.dat") to an otherwise incomplete rendering of the mail/item. If the recipient is Outlook/Exchange it can simply discard the incomplete outer message and use the encapsulated data directly, but if the recipient is any other program, the message received will be incomplete because the data in the TNEF attachment will be of little use without the Microsoft software for which it was created. As a workaround, numerous tools for (partially) decoding TNEF files exist. Outlook does not fully support data and syncing specifications for calendaring and contacts, such as iCalendar, CalDAV, SyncML, and vCard 3.0. Outlook 2007 claims to be fully iCalendar compliant; however, it does not support all core objects, such as VTODO or VJOURNAL. Also, Outlook supports vCard 2.1 and does not support multiple contacts in the vCard format as a single file. Outlook has also been criticized for having proprietary "Outlook extensions" to these Internet standards. As part of its Trustworthy Computing initiative, Microsoft took corrective steps to fix Outlook's reputation in Office Outlook 2003. Among the most publicized security features are that Office Outlook 2003 does not automatically load images in HTML emails or permit opening executable attachments by default, and includes a built-in Junk Mail filter. Service Pack 2 has augmented these features and adds an anti-phishing filter. Outlook add-ins are small helping programs for the Microsoft Outlook application. The main purpose of the add-ins is to add new functional capabilities into Microsoft Outlook and automate some routine operations. The term also refers to programs where the main function is to work on Outlook files, such as synchronization or backup utilities. Outlook add-ins may be developed in Microsoft Visual Studio or third-party tools such as Add-in Express. Outlook add-ins are not supported in Outlook Web App. From Outlook 97 on, Exchange Client Extensions are supported in Outlook. Outlook 2000 and later support specific COM components called Outlook AddIns. The exact supported features (such as .NET components) for later generations were extended with each release. In March 2016, Salesforce announced that its relationship intelligence platform, SalesforceIQ, would be able to seamlessly integrate with Outlook. SalesforceIQ works from inside the Outlook inbox providing data from CRM, email and customer social profiles. It also provides recommendations within the inbox on various aspects like meeting scheduling, contacts, responses etc. Microsoft Outlook Hotmail Connector (formerly Microsoft Office Outlook Connector), is a discontinued and defunct free add-in for Microsoft Outlook 2003, 2007 and 2010, intended to integrate Outlook.com (formerly Hotmail) into Microsoft Outlook. It uses DeltaSync, a proprietary Microsoft communications protocol that Hotmail formerly used. In version 12, access to tasks and notes and online synchronization with MSN Calendar is only available to MSN subscribers of paid premium accounts. Version 12.1, released in December 2008 as an optional upgrade, uses Windows Live Calendar instead of the former MSN Calendar. This meant that calendar features became free for all users, except for tasks synchronization which became unavailable. In April 2008, version 12.1 became a required upgrade to continue using the service as part of a migration from MSN Calendar to Windows Live Calendar. Microsoft Outlook 2013 and later have intrinsic support for accessing Outlook.com and its calendar over the Exchange ActiveSync (EAS) protocol, while older versions of Microsoft Outlook can read and synchronize Outlook.com emails over the IMAP protocol. Outlook Social Connector was a free add-in for Microsoft Outlook 2003 and 2007 by Microsoft that allowed integration of social networks such as Facebook, Linkedin and Windows Live Messenger into Microsoft Outlook. It was first introduced in November 18, 2009. Starting with Microsoft Office 2010, Outlook Social Connector is an integral part of Outlook. Since Microsoft Outlook does not support CalDAV and CardDAV protocol along the way, various 3rd-party software vendors developed Outlook add-ins to enable users synchronizing with CalDAV and CardDAV servers. CalConnect has a list of software that enable users to synchronize their calendars with CalDAV servers/contacts with CardDAV servers. Traditionally, Outlook supported importing messages from Outlook Express and Lotus Notes. In addition, Microsoft Outlook supports POP3 and IMAP protocols, enabling users to import mails from servers that support these protocols, such as Gmail or Rackspace Email. Microsoft Hotmail Connector add-in (described above) helps importing email from Hotmail accounts. Outlook 2013 later integrated the functionality of this add-in and added the ability to import email (as well as calendar) through Exchange ActiveSync protocol. There are some ways to get the emails from Thunderbird; the first is to use a tool that can convert a Thunderbird folder to a format that can be imported from Outlook Express. This method must be processed folder by folder. The other method is to use a couple of free tools that keep the original folder structure. If Exchange is available, an easier method is to connect the old mail client (Thunderbird) to Exchange using IMAP, and upload the original mail from the client to the Exchange account. ^ "Update history for Office for Mac". Microsoft Docs. Retrieved March 30, 2019. ^ "Top 10 Reasons to Use Outlook". PCWorld. February 10, 2009. ^ The version numbers follows the Office numbers. ^ "Microsoft Outlook Life-cycle Information". Retrieved October 23, 2011. ^ "XCLN: Microsoft Outlook for Windows 3.1x". Support.microsoft.com. August 18, 2005. Retrieved February 24, 2013. ^ "Microsoft Outlook 2002 Product Guide". Microsoft. May 30, 2001. Archived from the original (DOC) on February 7, 2003. Retrieved December 31, 2017. ^ "Microsoft Outlook 2002 Performance Tuning". Microsoft. June 7, 2001. Archived from the original (DOC) on October 4, 2003. Retrieved December 31, 2017. ^ "OL2002: Users Can Read Nonsecure E-mail as Plain Text". Support. Microsoft. Archived from the original on October 20, 2004. Retrieved December 31, 2017. ^ Mosher, Sue (August 26, 2002). "Office XP SP2 Brings Changes to Outlook". Windows IT Pro. Penton. Archived from the original on January 1, 2018. Retrieved January 1, 2018. ^ Mosher, Sue (March 25, 2004). "Tighter Security in Outlook 2002 SP2". Windows IT Pro. Penton. Archived from the original on January 1, 2018. Retrieved January 1, 2018. ^ "Microsoft Office 2003 Editions Product Guide". Microsoft. September 2003. Archived from the original (DOC) on November 4, 2005. Retrieved March 5, 2017. ^ Harkins, Susan (April 22, 2008). "How do I... Avoid e-mail spam using Outlook tools?". TechRepublic. CBS Interactive. Archived from the original on December 24, 2013. Retrieved January 2, 2018. ^ Rist, Oliver (August 20, 2004). "You have nothing to fear from Office 2003 SP1". InfoWorld. IDG. Archived from the original on December 31, 2017. Retrieved December 31, 2017. ^ Yegulalp, Serdar. "Microsoft Office 2003 SP2's antiphishing filter for Outlook". SearchExchange. TechTarget. Retrieved December 31, 2017. ^ "What's new in Microsoft Office Outlook 2007". Support. Microsoft. Archived from the original on January 23, 2010. Retrieved January 3, 2018. ^ Bruzzese J., Peter (February 4, 2008). "Outlook 2007 vs. Outlook 2003". Windows IT Pro. Penton. Archived from the original on January 3, 2018. Retrieved January 3, 2018. ^ a b "Discontinued features and modified functionality in Outlook 2007". Support. Microsoft. Archived from the original on December 27, 2009. Retrieved January 3, 2018. ^ "Outlook Mobile Service - How it works? Advantages? Features?". MSDN. Microsoft. April 9, 2008. Archived from the original on January 2, 2018. Retrieved January 3, 2018. ^ a b Byrne, Randy; Gregg, Ryan (2007). "Chapter 2: Outlook as a Platform". MSDN. Microsoft. Archived from the original on January 3, 2018. Retrieved January 3, 2018. ^ "What's new in Microsoft Outlook 2010". Support. Microsoft. Archived from the original on March 11, 2016. Retrieved January 3, 2017. ^ "What's new in Outlook 2016 for Windows". ^ Welsh, John C. (October 1, 2010). "Microsoft Outlook for Mac 2011". Macworld. IDG. Retrieved November 7, 2010. ^ a b "New Outlook for Mac available to Office 365". Office Blogs. Microsoft. October 31, 2014. Retrieved November 1, 2014. ^ Compare: "Office on iOS and Android". Office Blogs. Microsoft. January 29, 2015. Retrieved January 11, 2015. ^ "Microsoft Outlook 2007 Report | Email Standards Project". email-standards.org. Retrieved February 24, 2013. ^ "CSS Support Guide for Email Clients – Campaign Monitor". ^ "A designer's guide to Outlook 2013 and Office 365". ^ "Microsoft Office 2003 editions comparison". Microsoft. Retrieved October 3, 2008. ^ "Microsoft Outlook 2003: Using Junk E-mail Filters". uwec.edu. University of Wisconsin-Eau Claire. ^ "Microsoft Internet Safety and Security Center". Microsoft. ^ Miller, Ron. "Salesforce-Microsoft love grows with SalesforceIQ-Outlook integration | TechCrunch". Retrieved September 4, 2017. ^ "Microsoft Office Outlook Hotmail Connector overview". Microsoft Office website. Microsoft. Archived from the original on January 28, 2013. ^ "Transition information for former Office Live Small Business customers – Manage Office 365 – Office 365 – Microsoft Office 365 Community". Ask.officelive.com. Retrieved June 15, 2013. ^ a b "What's new in Outlook 2013". TechNet Library. Microsoft. December 11, 2012. Retrieved March 1, 2013. ^ "Add your Outlook.com account in Outlook for Windows". Office Support. Microsoft. Retrieved June 27, 2017. ^ Thomas, Doug (August 24, 2010). "How to install the Outlook Social Connector (video)". Office Casual blog. Microsoft. Retrieved March 1, 2013. ^ "Announcing the Outlook Social Connector". Outlook Blog. Microsoft. November 18, 2009. Retrieved March 1, 2013. ^ "Changes in Outlook 2010 (for IT pros)". TechNet Library. Microsoft. November 27, 2012. Retrieved March 1, 2013. ^ "CalDAV Clients". Archived from the original on May 23, 2016. ^ "Export messages and folders from Thunderbird to Outlook/Outlook Express/Windows Mail".